It’s baby quilt binding day! The almost-done quilt has been sitting in my closet since whenever I last posted it, just waiting for the finishing touch. I think that’s just part of the process, to let it breathe before you go in and do the final, possibly most pesky part of the quilt-making. (I know my mom has a few quilts that just need to be bound in her closet, Ahem.) I got myself together and made the binding last night with my trusty bias tape maker. The plan was to machine stitch the back this afternoon (in our wee window of the day where there’s actually light) so that I could work the hand stitched front tonight while Paul watches his beloved Spurs. Sometimes I think crochet wins out over sewing just because I can be semi-social with it, so I like to think of ways to bring my other crafts to the couch. I made quite a bit more binding than I needed, since I had the whole operation going anyway. I always end up using it on things like oven mitts or contrast collars, and it’s fun to have some prints in my stash. In fact, I just used some a couple weeks ago to make this fabric box for the craft fair. I was inspired by this tutorial, but changed it up and stacked the box parts, closing them with the bias edge. I used more bias tape to create the removable button-on divider (because I had necklaces on one side and earrings on the other, and because after a certain width, the box doesn’t want to hold it’s sides in). Now it can be my bias tape/binding stash. As if I needed another stash. By the way, thanks for all your nice comments about the craft fair. I know they can be hit or miss, and selling my hats is not my #1 priority anyway, but the last time I did one it went so well that I guess I was hoping for a similar response. It’s no big deal, and I’ve placed most of the inventory, I just wanted to vent. I hope everyone has a lovely weekend- I’ll be back Monday (if not sooner) to show you some cool stuff I found at last weekend’s Christmas Stroll. Um.... I know that fabric! I made three pillows for my couch with it!!! Very sweet quilt, soon to be a little ones favorite. 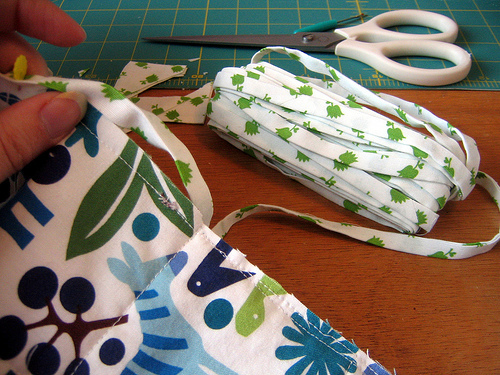 I am so glad you talked about making your own binding I had no idea that was possible, I am going to get myself one of those tools thanks for linking it up. 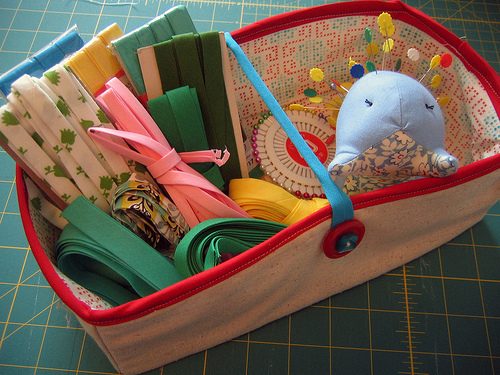 creatist- the pincushion is from the wonderful mary of http://www.carryboo.com. it's a little porcupine- i love it! 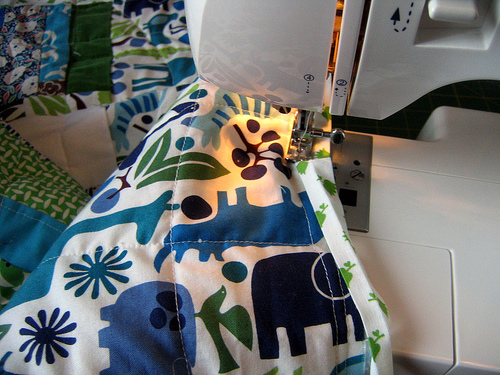 What adorable binding - and you did a great job on the quilt!